It’s the age old dilemma: you’re about to be socially active… maybe it’s a yoga class, biking with friends or just spending a hot day outdoors. You might not necessarily want to wear your heaviest face of makeup, but you want a little something something to feel put together. Sweat Cosmetics is a relatively new brand with makeup catered to women on-the-go that’s sweat and water-proof, all natural and hypoallergenic. The brand has four core products from mineral foundation to illuminator, all with at least SPF 25 for added goodness. While I’ll admit, I haven’t been as active as I like to be due to lots of life events, I am currently living in a climate that is about 112 degrees every day on average. Just existing outdoors for more than 10 minutes elicits a good sheen of sweat. So I thought I’d put a couple of Sweat Cosmetics products to the test. 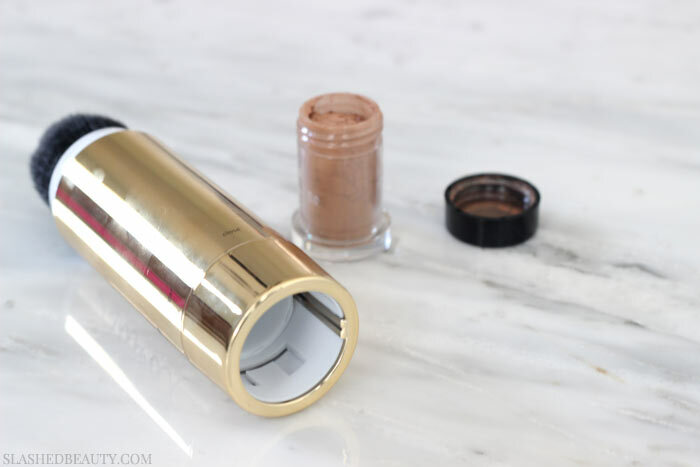 The products come in small capsules that twist into the bottom of their brush tools. Buying the product with the brush costs $42, while the product refill is only $24. The powder travels up the brush’s tube and straight out of the bristles, which have closed/open/buff settings to control the flow. I went ahead and applied their Mineral Foundation and Mineral Bronzer at 9AM on a day we’d be running a ton of errands and putting together furniture. I didn’t expect much coverage from the foundation, and I was pretty accurate. I had to apply concealer to my current problem areas on my chin and forehead to mask my acne. The rest of my skin tone looked even and soft, though. The bronzer was a surprise, though— it was incredibly pigmented and had a nice warm tone to it. Even though it has a subtle shimmer, I used it as a sun-kissed contour shade. I ran into an issue with the brush right away, though. The “open” mode is supposed to dispense product, while the “buff” setting is used for blending without adding more color. But as I blended, I felt like it was getting stronger and stronger. I ended up going in with a clean angled brush to clean and soften up the look. I added a bit of powder blush and highlight to the look that played nicely with the bronzer, blending easily. I liked the finish look, which was natural but defined. I went about my agenda, which consisted of a lot of shopping, unpacking boxes in our new home, putting together furniture and running other various errands. Throughout the day, I noticed the foundation breaking up a little bit and the sheer coverage it did give me not holding on as well as I had hoped. However, the bronzer was staying put and staying strong. After a full twelve hours of wear, I was impressed at how well the Mineral Bronzer held up. It had faded only slightly, but was still very visible… and had even held on to my blush! 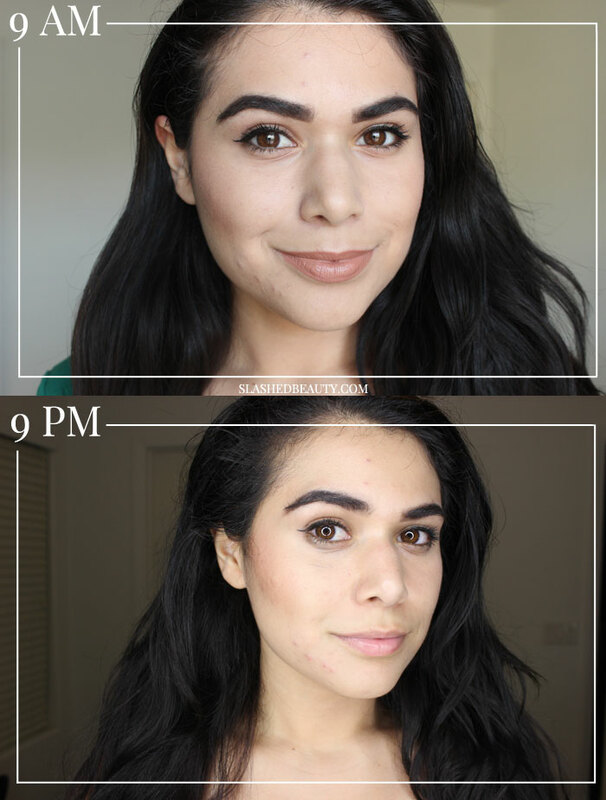 Even though the foundation had worn off, I still felt like I had a defined look since the bronzer hadn’t dissipated. 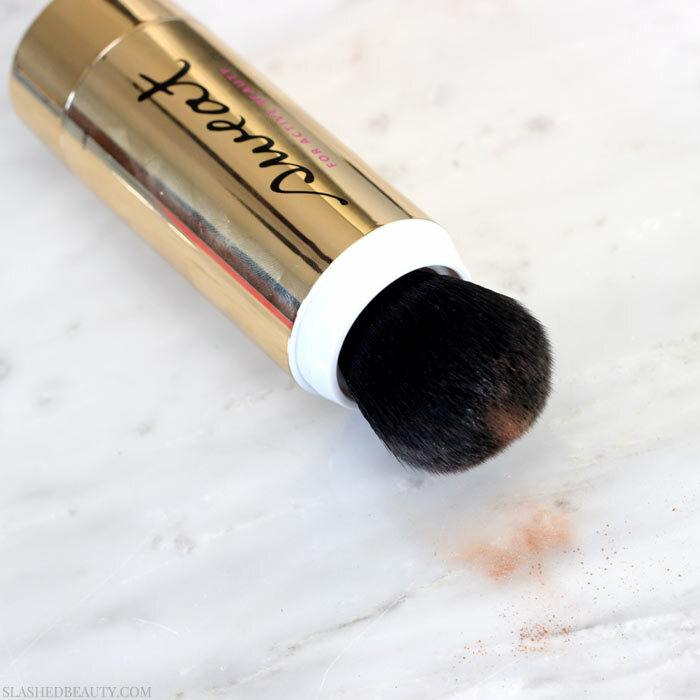 A lot of bronzers become patchy for me by the end of the day, but not this one! Overall, I think the Sweat Cosmetics Mineral Bronzer was a good find for active days— or even just long ones where I want my face makeup to last. If I’m looking to stay lightweight but polished, I may use it over a tinted moisturizer, conceal my problem areas and skip the foundation. Otherwise, I can definitely see myself adding this to my full face makeup routine as a long-lasting product in general. However, I do wish they would sell this as a compact— I love the formula, just not the brush applicator. Especially since you’re paying more up front for the brush, it seems like the packaging needs a bit of fine tuning before it’s actually worth the $42 total to start. Honestly at this point, I suggest buying the bronzer refill capsule and depotting the powder into an empty sifter container. It’ll cut your cost in half and you’ll have more control. Have you tried a sweat-proof bronzer before?